When I look back at the last couple of years a lot has happened, and I mean A LOT! And the last few months have been eventful but the wheels are starting to slow and the dust is settling. In terms of my professional life though, well, I'm happy to say that it has been steady, consistent and now is kicking into high gear! I've been working on Mission 2 of Mission US with the guys at EFS for over the last year and I am extremely excited. This mission is so involved and so rich in content! I think kids are really going to enjoy it. The preliminary reviews have been great and the teachers and students are anxious for it to come out. We finish production in January 2012 so it's crunch time! This past year a few of my closest friends and my sister got married. The festivities were wonderful! As most designers know, it is almost a given that one or some or most of your friends will at some point or another ask you to design something. For wedding invitations, this is almost always the case. Of course we don't do this for everyone but when it comes to our nearest and dearest I consider it an honour. So first there was my sister. Her and her husband were together for over 11 years before they got married. They're both finance professionals who met at work and over the course of a decade fell in love :) My sister and I are very close and so I came to know their relationship well and learned about their style fairly quickly. They're both smart, funny, kind and intimately warm people. Their style has developed through years of corporate travelling and business shmoozing, which means they love an exclusive restaurant with delicate, expensive wines and they have great taste when it comes to everything they buy. While I lived in New York I was lucky to be rooming with them because it allowed me to live in a West Village penthouse and a Lower East Side apartment with granite countertops. If it wasn't for them I'd still be up in Harlem in my shoebox of a room with a wall built by a drunk mexican and which I rented for what some people pay for a mortgage in the suburbs. Anyway... 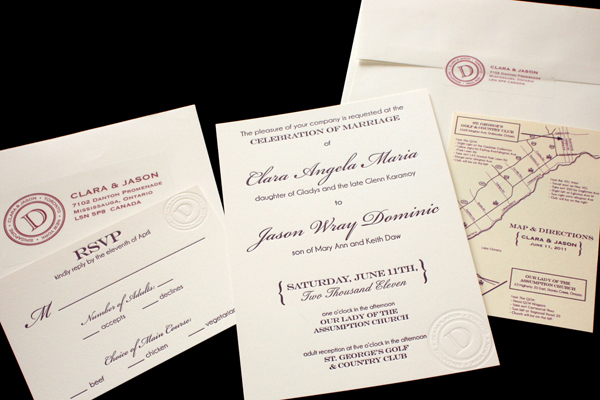 I knew when I designed their invitations that it had to reflect their taste but still be classic and simple. So I went about designing and thought first of a logo or monogram for the couple. It would be the unifying element for the printed items. I was pleased that the design of their logo developed quickly and easily. My sister was very particular about what she wanted the wedding to be like so she tweaked the design in her own ways and I obliged. In the end, I think I came up with a design that reflected them both well. When I designed the logo, I wanted to communicate their years of travel or at least their travelling lifestyle and since Toronto was their home, New York was where he proposed and Singapore is where they would start their married life, it was the perfect trio to include. I also looked to wine labels and liquor labels for inspiration. And when my sister told me she wanted letterpress invitations I was thrilled because everything looks so chic in letterpress, in my opinion. In addition, their venue was St. George's Golf & Country Club in Etobicoke, which has beautiful surroundings and interior details - think mahogany staircases. The interior exudes a certain old worldly charm so I wanted to give the invites the same traditional look that would reflect the reception. The final design was printed on an ivory card stock with a deep purple ink for the lettering. The monogram was pressed on with the same colour ink as the paper to have a reverse emboss effect. I opted to position the monogram a bit off tilt so as to feel like it was stamped individually by hand. They loved the way it turned out and I'm very happy with the result. 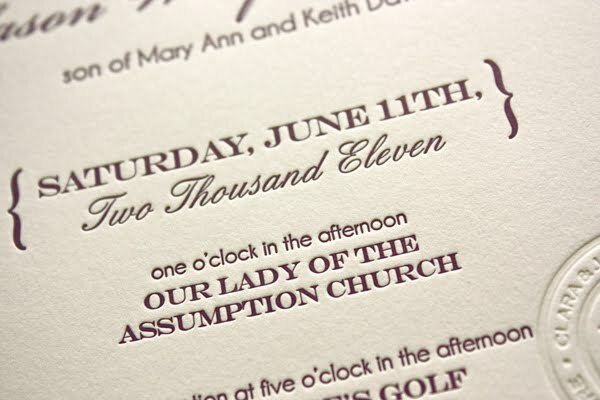 What was even better was that the printer could print the invites on just one plate because none of the areas overlapped so they could run the invites once for the text with the purple ink and a second time for the monogram with ivory ink. 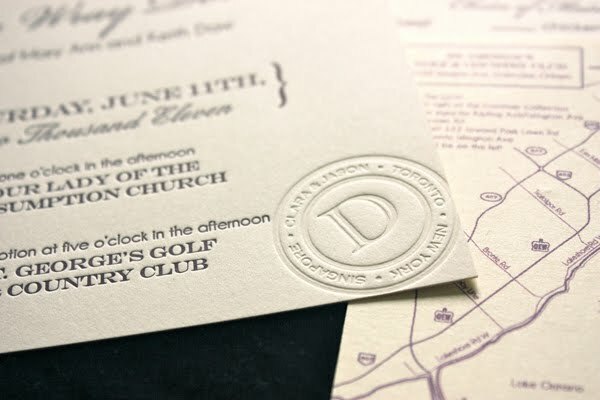 The invite and matching RSVP card was printed in letterpress, but the map was printed on a thinner card stock on a home printer. Because the church and the venue was quite a distance away (about an hour drive) and a lot of guests were expected from out of town, I drew the map myself to highlight only the important roads and have space to provide directions. Overall, I think the invitations look great and I was honoured that the couple loved it. I think it set the tone for the wedding and the reception dinner.